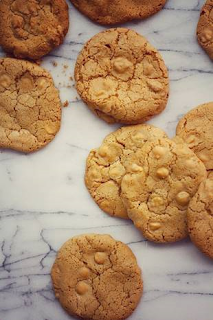 This holiday season, instead of making the same old sugar cookies, try something out-of-the-box like Terra’s Kitchen’s White Chocolate Ginger Cookie recipe. Combining the unusual, yet delicious flavor of ginger with the sweetness of the white chocolate chips, these cookies are sure to be an instant classic with friends and families. Drop by the heaping tablespoon full onto the prepared baking sheet and bake until lightly golden (12-15 minutes), cookies will appear still slightly soft in the middle, but will set up firmly as they cool. (Note: For smaller less decadent cookies use a teaspoon measure and bake for 8-10 minutes). Using a spatula, remove cookies from the parchment to cool. Repeat with the remaining cookie dough.